Spain on Thursday sent back to Morocco the 116 migrants who had forced their way into the Spanish territory of Ceuta, in a mass expulsion condemned by human rights activists. ‘The 116 sub-Saharan migrants who entered Spain via the Ceuta border illegally yesterday (Wednesday) have been sent back to Morocco,’ the Ceuta prefecture said in a statement. A group of men wait outside the Temporary Immigrant Stay Centre after over 100 migrants forced their way into the Spanish territory of Ceuta on 22 August. 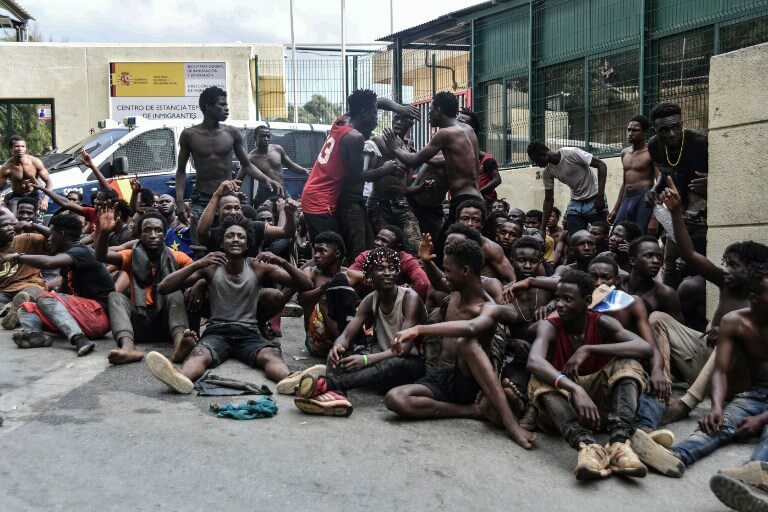 The migrants made their way into Ceuta after storming a barbed-wire border fence with Morocco and attacking police with caustic quicklime, a local official said. The Walking Borders humanitarian group described the return of the migrants as a ‘huge violation of human rights by the Spanish government’. However the Spanish interior ministry defended the ‘legality’ of the expulsion. ‘Once Morocco indicated it would accept these people … the national police went to look for them at the holding centre for foreigners and transferred them to the police station … All of them had a lawyer, an interpreter and medical aid,’ a ministry spokesperson said. ‘All were told of the possibility of applying for asylum but they didn’t do it,’ the spokesperson added, also saying that two minors in the group remained in Spain.